White Dead Nettle (Lamium Album)is known as other names: Archangel, White Archangel, Archangélique, Bee Nettle, Blind Nettle, Deaf Nettle, Deadnettle, Dumb Nettle, Herbe Archangélique, Lamier Blanc, Lamii Albi Flos, Lamium album, Ortie Blanche, Ortie Folle, Ortie Molle, Ortie Morte, Ortiga Blanca, Ortiga Muerta, Stingless Nettle, White Archangel, White Nettle, Nettle Flowers, Snowflake, Stingless Nettle. White dead nettle is a perennially growing flowering herb belonging to the Lamiaceae family. The stems of this plant may grow up to a height of 2 feet. The leaves of the plant are oval, jagged, have long stalks and are arranged in pairs opposite to each other. The leaves have a triangular smoothed base and grow up to 3 cm to 8 cm in length and are 2 cm to 5 cm in width. In addition, white dead nettle leaves are softly bristled having an indented border and a petiole that is approximately 5 cm in length. Similar to several other members of the Lamiaceae family, white dead nettle leaves seem to be outwardly akin to the leaves of stinging nettle (botanical name, Urtica dioica), but they do not possess the sting. The apparent similarity helps to put off rabbits as well as other herbivorous animals from eating the plant - they are apprehensive that this plant may also sting. The plant bears white flowers during the period between May and October that appear in whorls in the leaf axils. White dead nettle flowers possess two lips - the upper lip is hooked and hairy on the exterior, while the lower lip has around two to three lobes. Since white dead nettle has a very similar superficial appearance to the stinging nettle, hikers are likely to generally avoid this undamaging plant. On the other hand, bumblebees are not likely to be misleading in the same manner. In fact, bumblebees swarm the flowers of white dead nettle for they are aware that the plant, akin to other members in the mint family, possesses a profuse supply of nectar. In effect, white dead nettle is said to be ‘dead' only because it does not have the sting. People in Britain call the white dead nettle ‘archangel', perhaps owing to the fact that its first blooms of the season appear sometime around May 8 - the day was once celebrated as Archangel Michael's feast day. 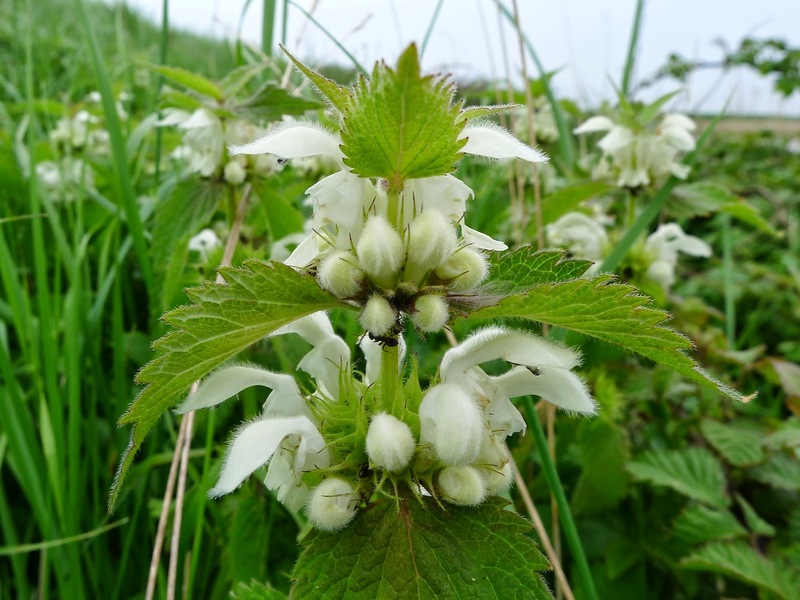 It may be noted that in conventional medicine white dead nettle has never been considered as a great herbal remedy and, hence, it has never found an appropriate place. Nevertheless, the herb has been a well-accepted traditional medication for a number of health conditions. This flowering plant encloses high amounts of tannins and has been effective for dressing injuries, cuts and burns owing to its anti-inflammatory as well as astringent attributes. In addition, an herbal tea brewed with white dead nettle is known to be an excellent remedy for diarrhea. In earlier days, white dead nettle was held in repute in England for its supposed efficacy in curing scrofula (tuberculosis of the lymphatic glands) purported as the King's Evil, since people believed that the ailment could be cured by the touch of a monarch. In effect, ancient Roman naturalist and physician Pliny had already mentioned about the white dead nettle leaves in the first century A.D. as a traditional medication for this ailment when it is blended with axle grease. According to pharmacologists, using the herb to treat diarrhea may be highly effective owing to the tannins enclosed by white dead nettle. White dead nettle is an astringent and demulcent herb that is chiefly used as a uterine tonic, to arrest inter-menstrual bleeding and to reduce excessive menstrual flow. It is a traditional treatment for abnormal vaginal discharge and is sometimes taken to relieve painful periods. The astringent attribute of this plant aids in curing diarrhea and it is also applied topically to ease varicose veins and haemorrhoids. The flowering tops are antispasmodic, astringent, cholagogue, depurative, diuretic, expectorant, haemostatic, hypnotic, pectoral, resolvent, sedative, styptic, tonic, vasoconstrictor and vulnerary. An infusion is used in the treatment of kidney and bladder complaints, menstrual problems, bleeding after childbirth, vaginal discharges and prostatitis. The infusion is also applied topically as compresses to effectively treat varicose veins, piles and ease ophthalmic problems. Externally, the plant is made into compresses and applied to piles, varicose veins and vaginal discharges. A distilled water from the flowers and leaves makes an excellent and effective eye lotion to relieve ophthalmic conditions. The plant is harvested in the summer and can be dried for later use. A homeopathic remedy is made from the plant. It is used in the treatment of bladder and kidney disorders and amenorrhoea. The haemostatic, tranquilizing and gentle astringent actions of Lamium, the plant family to which white dead nettle belongs, are attributed to the tannins enclosed by the plants. Similarly, the saponins contained by them are said to be responsible for their gentle expectorant action. Preparations using white dead nettle herb can be used in various ways, including as a compress to treat eczema, wounds and burns and also as a gargle to cure aching throats. In fact, white dead nettle is an effective herbal medication for regulating the intestinal activities and bowel movements. Herbalists in France use this plant to rinse out the kidneys as well as to cure haematuria (presence of red blood cells in urine). In Sweden, people often consume the leaves of white dead nettle in the form of a pot-herb. However, the leaves have an unacceptable smell when they are crushed. The stalks of white dead nettle are a plaything for young boys, who use them as whistles. The plant has been widely used as an herbal tea to treat lung problems. The leaves of the plant are crushed and applied topically to cure tumours as well as scrofula (initial stage of tuberculosis of the lymphatic glands). White dead nettle flower seems safe for most people when taken by mouth. But there isn’t enough information to know whether it is safe when applied directly to the skin or other areas of the body. Not enough is known about the use of white dead nettle flower during pregnancy and breast-feeding. Stay on the safe side and avoid use.